Easy drag-and-drop batch image processing. Is there a better alternative to ImageMachine? Is ImageMachine really the best app in Image Editing category? Will ImageMachine work good on macOS 10.13.4? 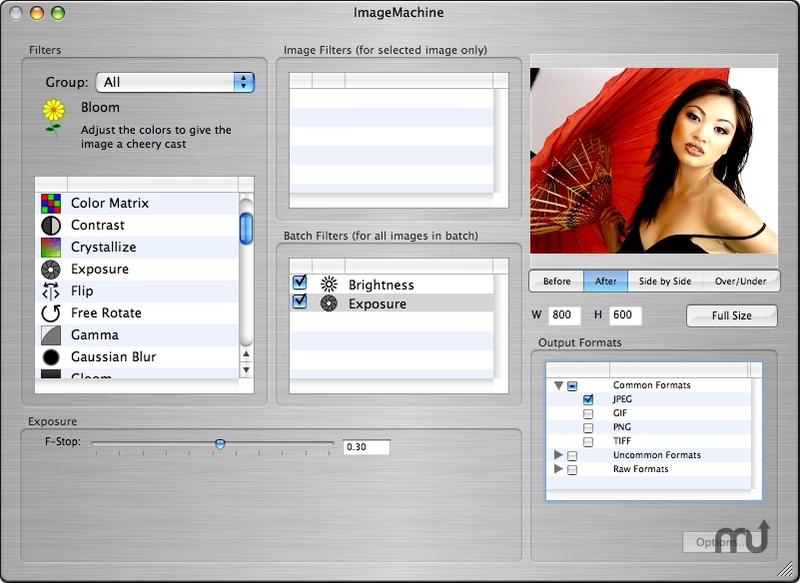 ImageMachine provides easy, drag-and-drop batch image processing. It supports over 70 file formats, and features 33 image filters. ImageMachine needs a review. Be the first to review this app and get the discussion started! ImageMachine needs a rating. Be the first to rate this app and get the discussion started! Modern computers come equipped with a powerful GPU (Graphics Processing Unit), which sits idle most of the time. Unless you're playing graphics-intensive 3D games, the power of your GPU remains largely untapped. ImageMachine leverages this power by using Apple's Core Image library. The GPU is put to work in applying a broad library of image filters, ranging from simple color shifts to drastic geometric transformations. ImageMachine is multithreaded, so it will take full use of newer Macs with multiple cores and/or CPUs. ImageMachine's Universal Binary runs natively on both Intel and PPC Macs.